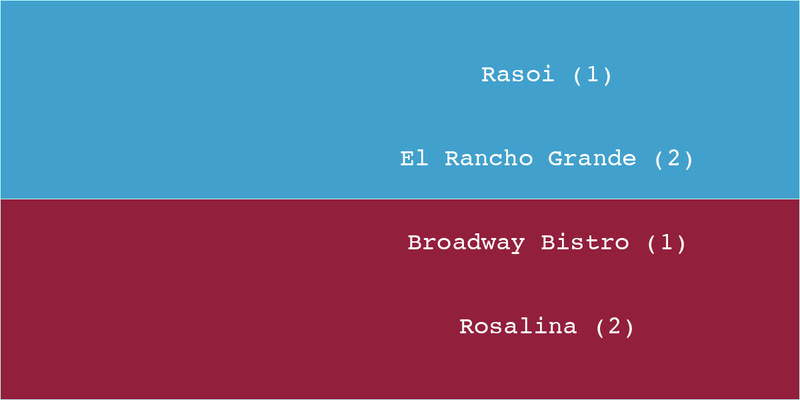 Rasoi definitely has a following – “so good!”, “spicy and good,” “can’t get enough of this place” – but El Rancho Grande sails through with the Division A title. Why? In the words of one voter, “cause they rock, and they’re the hardest working family in the biz.” Next up, they face either Sun & Moon or Ebisu. Division H was a tossup. Broadway Bistro (“a Providence icon”) had a clear lead at halftime with their “consistent and compelling” food, but Rosalina picked up a big wave of support in the second half for the title. Voters had all sorts of reasons why: “the kitchen staff is very entertaining”; “Phil does an amazing job and he’s pretty cute too”;* “bronzini flown in from Greece…” Next up, they’ll face either nicks on broadway or north. *It’s quite possible that Phil said that himself.